A 4-year-old girl is already out of the hospital and is said to be in good shape after she fell out the back door of a moving church bus, which continued driving down the road. 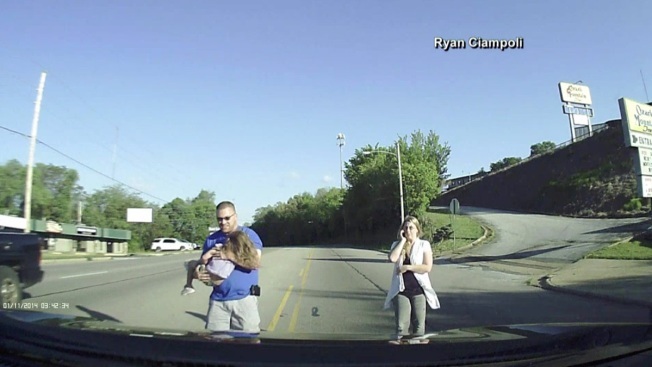 Volunteer firefighter Ryan Ciampoli was driving behind the bus in Harrison, Arkansas, Friday when his dashcam recorded the moment the girl tumbled to the ground. The video shows Ciampoli stop his truck, get out and approach the girl, who he said was unconcious at first but then started to wake up. Ciampoli, a licensed EMT, picked up the little girl, who had cuts on her face and blood coming out of her nose and mouth. He said he wouldn't normally move someone with a traumatic injury, but he didn't want to leave her in the midde of the road and risk her being hit by a car. Ciampoli, who gave a statement to police, added that the bus had continued driving but returned about 15 minutes later. The bus driver also gave a statement to police, but its details were not immediately available. It is unclear whether the back door of the bus was left unlocked or if the girl opened the door herself. It is also unclear whether anyone inside the bus was aware the girl had fallen out at the time. Ciampoli said the girl's family told him she has a broken jaw but will make a full recovery.